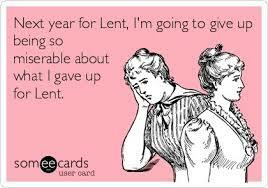 I’d like to think about “giving up X for Lent” today. I am honestly respectful of the notion that additional resources ought to be devoted to experiencing Lent—the dark season of the church—fully. I am pretty open-minded about just how to go about that. 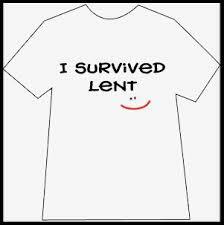 When it comes to “giving up”—one strategy among several—things “for Lent,” I am more inclined toward public skepticism and private amusement. So, what is Lent and what is it for? For many churches, Lent is the period from Ash Wednesday, which was March 5 this year, to Easter Sunday, which will be on April 20 this year. That’s 40 days exactly if you don’t count Sundays. Why 40? Forty is a “set aside” sort of number. 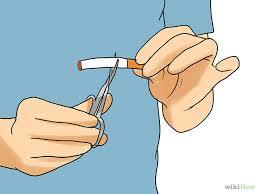 Forty years in the wilderness; forty days of testing in the desert; forty days in the preparation of the church. So if 40 is a “specially set aside” sort of number, what are the forty days of Lent set aside for? I’ve always been more interested in the individual observation of Lent and it is in that sense that the question of “what is Lent for?” can be posed. Lent is ordinarily observed as a time of dark and quiet so the way I ask questions would have to lead me to ask what is so good about dark and quiet? In the context of Lent, if Lent is a preparation for Easter, the answer is that it gives Easter a much more powerful effect than it would have had if you had not prepared yourself for it. If you are looking for a celebration of Easter than will shake you right down to your shoes, a dark and quiet Lenten season would be the way to do it. There is nothing puzzling about the effect. It is the difference between being in a dark room for a long time and then coming into a bright room. It’s a trumpet fanfare after a long silence. The relation of Lent to Easter is just like that, so it leads to the question of whether you want to experience Easter in a way that has a powerful effect on you. But Lent isn’t just a dark and quiet room and Easter isn’t just the full light of day. There is more to it in each case—at least there can be. In the dark room, your pupils contract so as to make the best use of whatever light there is. Our selves don’t react to the dark season the way our pupils react to the dark room. If you are going to use your time in the dark, you are going to have to know what you are doing and some discipline might be required. That brings some unusual Lenten questions, for instance: a) what does Easter mean to the church and b) what does it mean to me particularly? I’m not going to try to answer either question, except to suggest what Lent might be used for, but Lent is the time to prepare yourself for fully experiencing what Easter means. It might mean “victory over death.” Certainly, there are some scriptural supports for that notion. It refer to the disciples’ realization that the life of Jesus, which appeared to end in defeat, was all it ever appeared to be and more. Easter is the time when we realize that, again, ourselves. It might mean that God actually did pay the ultimate price—the price He spared Abraham—to redeem humanity and there is no denying the depth of His care for us. But really, this is not different from my advising you to take a #33 bus because it will take you where you are trying to go, although I myself take a #22 bus because I need to go somewhere else. It is not different from that in the slightest degree—except, of course, by being trivial. If we could do that—with and for each other—you can see how far we have come from “giving up marshmallows for Lent. There is a lot of popular ridicule associated with “giving up X for Lent.” I didn’t know that before I reviewed the images associated with. I have put some of them here, but if you’d like the full experience, google “giving it up for Lent” and hit “images.” You will be amazed. 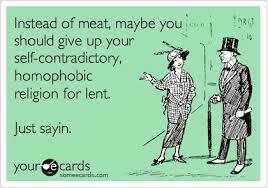 So I would like to advocate a thoughtful alignment of what we do in Lent with how we want to celebrate Easter. I think if we do that, we won’t be quite so easy to parody. Haggis is a savoury pudding containing sheep’s pluck (heart, liver and lungs); minced with onion, oatmeal, suet, spices, and salt, mixed with stock, and traditionally encased in the animal’s stomach and simmered for approximately three hours—or so says Wikipedia. Raymond Brown says that our Bibles tell three stories; The Old Testament tells about the law and the prophets. The New Testament tells about the ministry of Jesus and the foundation of the church. That’s too simple, as Brown admits, but it is interesting that there is a 40 at the front end of each of them. It is not an accidental sort of number. This entry was posted in Living My Life, Paying Attention, Theology and tagged display, Easter, experience, giving up something, Lent, liturgy. Bookmark the permalink.